Host: Equatorial Guinea. Dates: 17 January - 8 February. Coverage: Live text commentary and reports on every game, plus all the latest news from the tournament, on the BBC Sport website. Manchester City midfielder Yaya Toure has become the first player to be named Confederation of African Football African Footballer of the Year four years in a row. 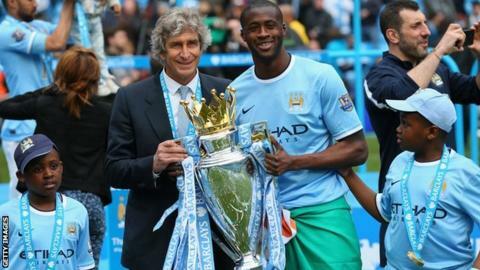 Toure, 31, was nominated after playing a pivotal role in winning the Premier League and League Cup. He also helped Ivory Coast qualify for the 2015 Africa Cup of Nations. Toure beat off the challenge of Gabon striker Pierre-Emerick Aubameyang and Nigeria goalkeeper Vincent Enyeama. Midfielder Toure scored 20 goals in City's title-winning campaign and also netted the equaliser in the 3-1 Capital One Cup final victory over Sunderland at Wembley last March. He has nine goals in 26 appearances for City in all competitions so far this season, including six goals in his last nine outings. Toure also made the Fifa shortlist for the 2014 Ballon D'Or prize in October. However, he has also had to contend with the disappointment of being part of an Ivory Coast side that lost two out of their three World Cup games. He was given the news of his brother Ibrahim's death only hours after the team lost their second World Cup match 2-1 to Colombia. He also hit the headlines in May as a row over a birthday cake threatened to bring an end to his Manchester City career. Everton striker Samuel Eto'o is the only other player to win the African Footballer of the Year award four times but his achievement was not in successive years.